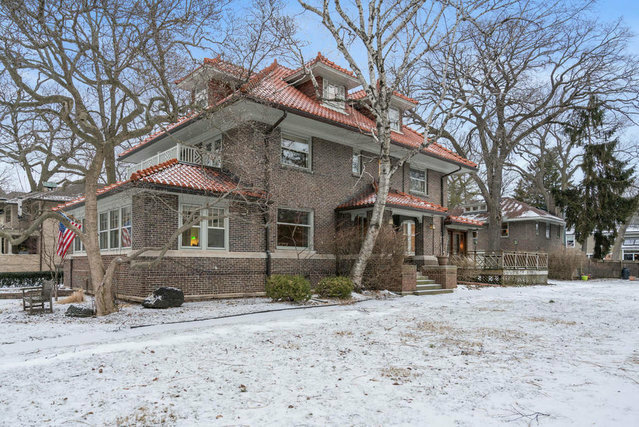 Stately brick home on oversized (88x187) lot in phenomenal East Wilmette location just two blocks from Lake Michigan/Beach. Grand room sizes with flowing first floor make this the perfect family and entertaining home. Spacious living room (with fireplace) and dining room connect via French doors to the bright sunroom - perfect as an office space or additional sitting room.White kitchen opens to beautiful family room and breakfast room which overlooks the back and side yard. Master suite is grand in size with French doors leading to a private balcony. Three additional bedrooms with two en suite bathrooms complete the second floor.The third floor space includes two bedrooms, full bath and extra tv/play space. Finished basement has large rec space in addition to work out room, sauna and laundry. The huge bonus is the fabulous coach house over the heated garage with two bedrooms/living room/kitchen/bath/laundry/loft space. Currently used as an AirBnB but also perfect for guests, office, au pair. Do not miss!